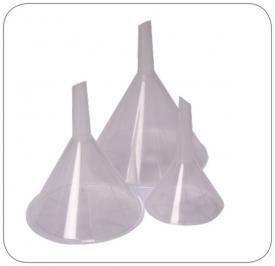 Perfect student funnel set. Funnels have eight internal ribs to facilitate filtration. Delivery information: Set includes each 5 ml (Top O-Ø: 37 mm/Stem length: 30 mm), 25 ml (Top O-Ø: 56 mm/Stem length: 30 mm), and 40 ml (Top O-Ø: 67 mm/Stem length: 30 mm) funnels.